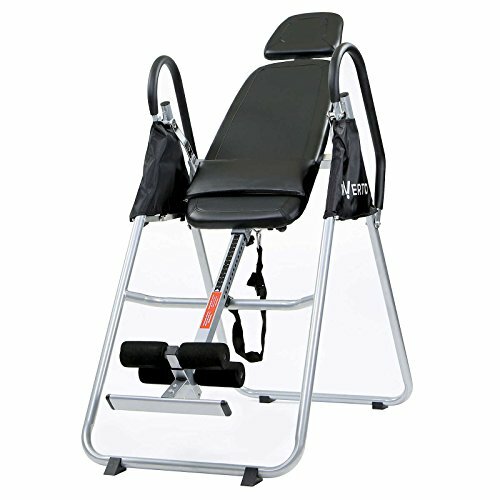 The Top 7 Affordable Inversion Tables. But first, here’s what led to this quest. I’ve previously talked about some unpleasant pains that had me knocking on my ortho doc’s door and getting some therapy. What I didn’t mention at the time was that I also suffered from a herniated disc. I like to think that I’m almost as good as new these days – and maybe that’s where the trouble starts. I always forget my bad back when I carry things — just simple stuff really, like a basket of laundry or a pile of books. Or pushing a heavy cabinet, or hoovering under the sofa. The worst to happen would be a thrown back. If you’ve seen those seniors who suddenly can’t unbend from the waist, that’s me. Happily, that’s rare. More common is when I feel a compression in my spine and need more therapy. In spinal decompression therapy, I’m put in a harness of sorts and my neck is pulled steadily by a machine. Sounds like torture? I get a painkiller beforehand and yes, it does help in unloading pressure from my spine and body. I get relief. And that’s right about when I found out about inversion tables, where I can get the same therapy but in the comfort of my own home. If you have back pain, headaches, breathing problems, varicose veins, or simply want to do it for fitness reasons, inversion therapy might be just the thing for you. These reviews feature choices at a range of price points, so, if money’s not your prime concern, and you’re simply looking for the best quality inversion table, then you’ll find what you want. The following reviews include height and weight ranges for each inversion table or tilt board. Please ensure you purchase the correct model for your size. And as always, consult with your doctor if you are in any way unsure as to whether an inversion table is right for you. The following table compares the 3 best premium inversion tables – that’s followed by full reviews of the top 5. Let’s start off our list with a durable and multi-featured Innova inversion table. Innova is one of the known brands when it comes to inversion tables. This model is particularly recommended because it comes with a removable heating and massage pad. 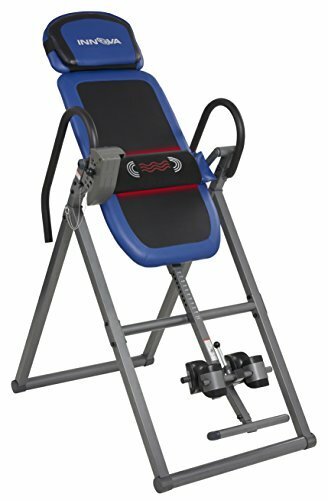 This is a mid-priced inversion table that does its job. It is ideal for people with body aches and pains that can be alleviated by heat, massage, and inversion. Designed for individuals from 4’10”-6’6” and up to 300lbs, the Health Gear comes with a removable heat massage pad that does not require a power outlet to be used. Offering multiposition heated comfort, this is easy to assemble. 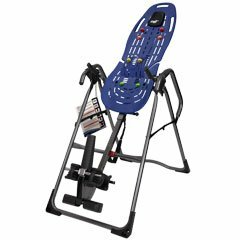 A mid-priced item that would suit those looking to use an inversion table for general pain relief, and to ease aching muscles. The Innova Fitness ITX9800 is designed for users from 4’0”-6’6” and up to 300lbs. It features patent-pending straps to provide unrivalled comfort and inverts through a range of five positions. There is an adjustable headrest for additional comfort, and the frame is tubular steel with a scratch-resistant powder coating. The ankle support offered by the ITX9800 could be improved. It is relatively easy to assemble. Somewhat let down by the poor-quality ankle support, which is an important part of users’ comfort and security. Designed for individuals from 4’10”-6’6” and up to 300lbs, this Teeter table from the sector leader features pre-set incline markers. You can be sure you’re following a recommended therapy regime accurately. The board of the table is contoured to ensure the ultimate in comfort and support. There is also an extended ankle lock handle. This is ideal for those who are of shorter stature or less able to stretch to reach standard locks. The board of the table is contoured to ensure the ultimate in comfort and support. There is also an extended ankle lock handle. This is ideal for those who are of shorter stature or less able to stretch to reach standard locks. The one drawback for this is that it doesn’t fold flat, so you’ll have to make peace with losing floor space if ever. A top-ticket model but with unrivaled user ergonomics. It is sadly not suitable if you have a small apartment or storage space, and need a table you can fold away between uses. 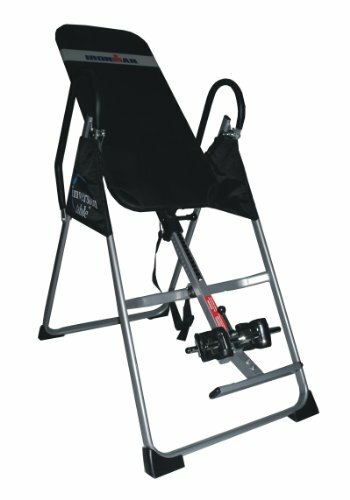 An inversion table designed to safely support users up to 350lbs and from 4’10”-6’6”, this is a strong, sturdy, and durable inversion table. It has a patent-approved locking system, extended support, and safety bars for complete peace of mind. As with other models, the ankle straps could be improved. Still, this is an ideal table for larger individuals looking for a natural way to help relieve back and joint pain. 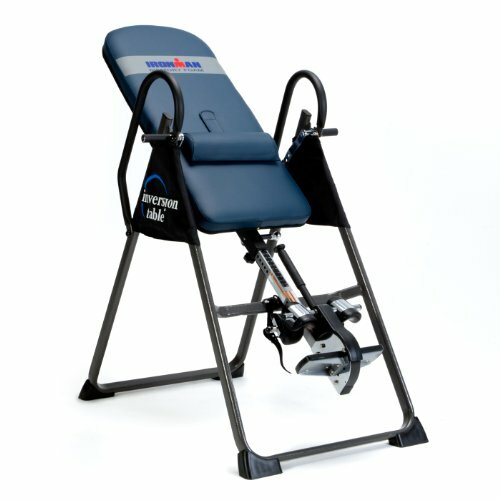 Up to 350lb – able to handle 50lb more weight than other inversion tables. For the larger user, this is definitely the table to buy. Not all inversion tables are foldable. 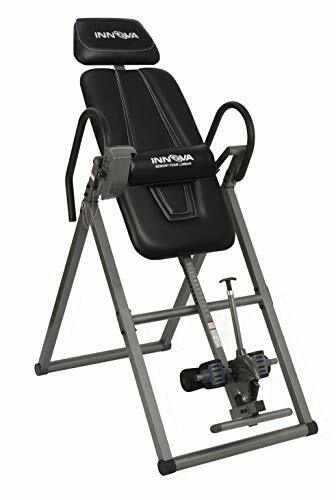 If you need an inversion table that can be easily folded and stored away, we highly recommend the Innova ITM4800. Not only does it have all the features we want in an inversion table, it’s even got extra bells and whistles like heat and massage. 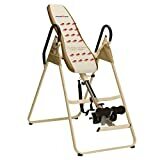 This model is Amazon’s Choice for inversion tables. 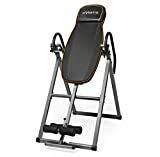 Granted, we don’t know of any inversion table with a built-in lock-in-folded position but it would be a nice feature for manufacturers to add on. If you have kids or small children in the house, just leaning a folded inversion table against the wall won’t cut it. You need to make sure it doesn’t fall when accidentally nudged or unbalanced. Putting it in a secure place where it won’t budge or maybe storing it under the bed may be the best option if you have kids or pets at home. 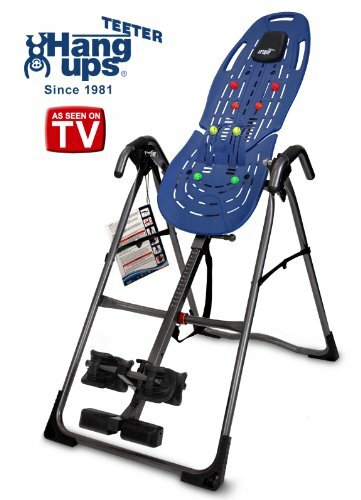 If your main concern is the ease of folding and putting away your inversion table, then we’d point you to the Teeter EP-560. A lot of manufacturers have the folding feature as an afterthought but we’ve seen the Teeter brand genuinely invested in educating its users how to properly stow away their Teeter tables when not in use. 20 inch x 26.8 inch x 66 inch (50.8 x 73 x 167.6 cm). In an ideal world, we’d have all the space we need to have lots of gym equipment lying about. More often than not, though, we need to stow our gear away. That’s something that Teeter really understands. Check out these videos that teach you how to fold their inversion tables. This second video is more relevant for senior folks and those who are suffering from back or spine problems. If you’re using an inversion table, chances are you shouldn’t be carrying anything remotely heavy. This video is super helpful because it teaches you an easy trick on how to put away your Teeter without having to pick it up and carry it. Many of us with muscle or spine problems know from experience that heat therapy is our best friend. If you respond well to heat and are planning to buy an inversion table, then getting an infrared inversion table makes a lot of sense. We’ve done the research for you and as of writing, there is only one brand (and only two models) that we would actually recommend. If you have the space and the budget, get the Ironman 4000. It is one of the best inversion tables on the market and it’s got infrared. The temperature can be adjusted from 90-140 degrees Fahrenheit and it takes 10-15 minutes to heat up. The heat is soothing, relaxing, and most importantly, pain-relieving. If you want the Ironman 4000 but can’t afford the price tag, then check out the 1000 model. Granted, the 4000 is the newer model and the frame has a leg up on quality and construction, however, the Ironman 1000 is not far behind. One big win that the 1000 has over its big bro is that it is cheaper AND foldable. Both models are similar when it comes to the infrared heating component. Same temperature and same heating up time. The heat is soothing, relaxing, and most importantly, pain-relieving. It is very likely that the item you buy will do its job as advertised and will work forever. However, you’ll have to be ready for the eventuality that the heating component may stop working at some point and replacement or repair may become an issue. Are you on a limited budget? 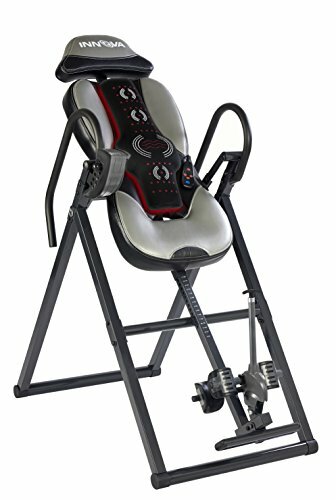 Are you looking for an inversion table that might not have all the bells and whistles but will do a good job? You’d be surprised but there are still some great picks to be had in this price range. That’s good news for people who are suffering from back pain but find professional inversion therapy sessions expensive. At such low prices, you can do it from the comfort of your own home. 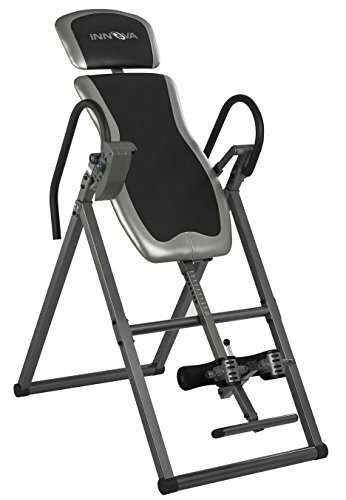 Check out the top 3 affordable inversion tables and then read the full reviews below. The Ironman Gravity is suitable for individuals from 4’10” – 6’6” and up to 300lbs. It features ergonomically moulded ankle support cushions for improved comfort and a soft, foam-coated, nylon back rest. It is made of tubular steel with a scratch resistant powder coating, and the ankle locking system is very comfortable and secure giving you complete peace of mind. While the Ironman claims to fold flat for storage, this in not actually the case. It needs to be partially disassembled for storage and is still quite bulky—you wouldn’t be able to stow it under a bed, for example. This is a common problem with inversion tables which are designed to remain assembled at all times. However, in an apartment, for example, this can be a problem as they do tend to have rather a large footprint. Does not fold flat for storage. 4’10”-6’6”, and up to 300lbs. Users at the top end of the weight range may feel more comfortable having the Ironman professionally assembled. If you are able to have your table up all the time without missing the space, this is a comfortable introductory model for people just getting started with inversion as a form of therapy. The Innova ITX9700 is designed for individuals from 4’10”-6’6” and up to 300lbs, and can be used with a hot or cold lumbar compress (not included.) It features an adjustable head pillow for added comfort and inverts through four positions. It is well built, although the ankle supports could do with some improvement. It features memory foam padding for improved backrest comfort. A reasonable, mid-priced model, with the added comfort of memory foam. A good quality budget model the Exerpeutic is suitable for individuals from 4’10-6’6” and up to 300lbs. It features a steel frame and a full-length safety bar with an adjustable, durable leather strap. The steel frame is powder coated to provide a scratch-resistant finish, and the unit offers full inversion. However, it does not lock out at 180 degrees so a spotter will be required for safety. The Exerpeutic also features a secure ankle locking system. 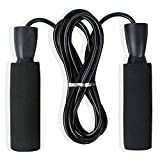 In general, the Exerpeutic is excellent for beginners at a good price. For a beginner who is happy and able to use this type of tool under supervision, this is a very affordable purchase. The Invertio is designed for those from 4’10”-6’6”, and up to 300lbs, and includes height adjustments on the unit itself, for ease of reference, ensuring a safe session. The Invictus offers full inversion and features a heavy duty steel frame. It can also be folded for storage. The marked height adjustments make this an ideal purchase for those looking for complete safety. The Invertio is designed for individuals from 5’1” – 6’6” and up to 300lbs so it does not have the height range of some inversion tables. Shorter individuals would not be suited to this inversion table. It uses an innovative design depth bar rather than straps to provide safety and security during inversion and can be used with or without the padded headrest. 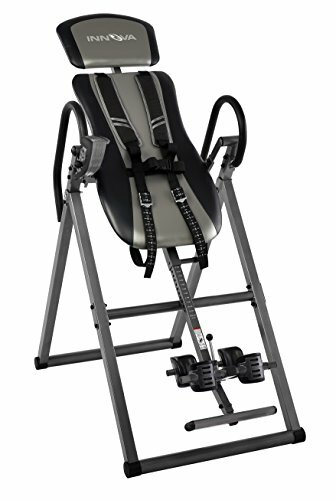 The inversion table itself features a heavy duty steel frame for complete peace of mind, and it is easy to assemble. As the headrest is designed to be removable, it does have a tendency to come loose during use, but it can be safely used without the headrest. 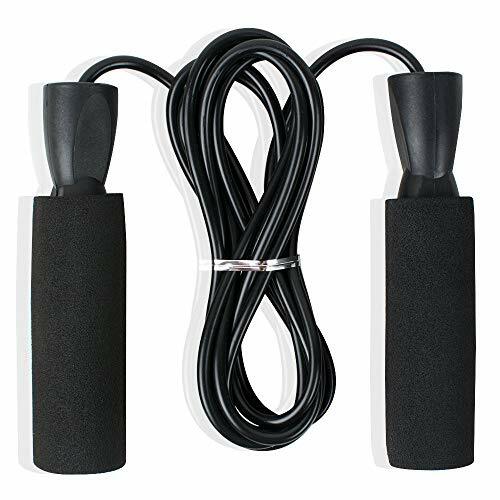 Depth bar, rather than straps – easier to operate for those with poor muscular strength. Also offers increased durability. Headrest has a tendency to come loose, although unit can be safely used without it. This does not have the height range of other models and is designed for those from 5’1”-6’6”, and up to 300lbs. Shorter individuals may benefit from a different inversion table that is designed to accommodate them. 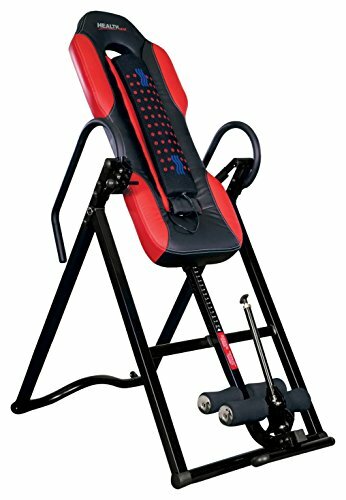 For those over 5 feet tall looking for a heavy duty inversion table and who are not concerned about storing it, this could be a good buy. For shorter individuals or those who need the space day to day, it wouldn’t be suitable. Designed for individuals from 4’8″-6’6” and up to 300lbs, the Innova ITM4800 adds a light massage for all-around back pain relief. 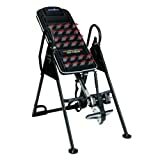 It is a sturdy unit that offers four positions and automatic or manual massage. You will need to position the Innova near a power outlet should you wish to use the massage function. It is a sturdy, foldable table offering comfort, safety, and convenience. It features a comfort padded backrest. The Innova ITM4800 is easy to assemble. For those looking for all round back pain relief, this is a worthwhile purchase. 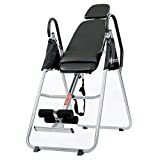 It is also very affordable and a good purchase for anyone looking to start inversion table therapy or continue the experience of a tilt board in the comfort of their own home. Definitely a good buy. No reason to hesitate on this – if you want a good quality basic inversion table, at a good price, you’ve found what you’re looking for.